Yale had a confusing numbering system for the single and double pin dial models. The Double pin dial with the Sunday Attachment as well as the single pin dial with the Sunday Attachment are designated as No. 1 and No. 2 even though the No. 1 was introduced in 1875 and the number 2 was not produced until 1883. A catalog from 1883 supports this information also notice the retail pricing. $450 in 1883 is about $9000 in 2016, see reproduction below. Notice the misprint of the time lock illustration showing it upside down. To protect the timer movements from stopping if the vault's boltwork is jammed or forced against the bolt dogging block (J), Mr Stockwell designed a split yolk (G) held together by a spring (g). If upward motion of the counter-balanced lever (F) is impeded, the spring (g) permits the two sections of toke (G) to separate and the rollers rise up and down on their friction pins without stopping the movements. When the obstruction or impediment is removed, the operation of the spring (g) will raise lever (F) and block (J) to the locked position. 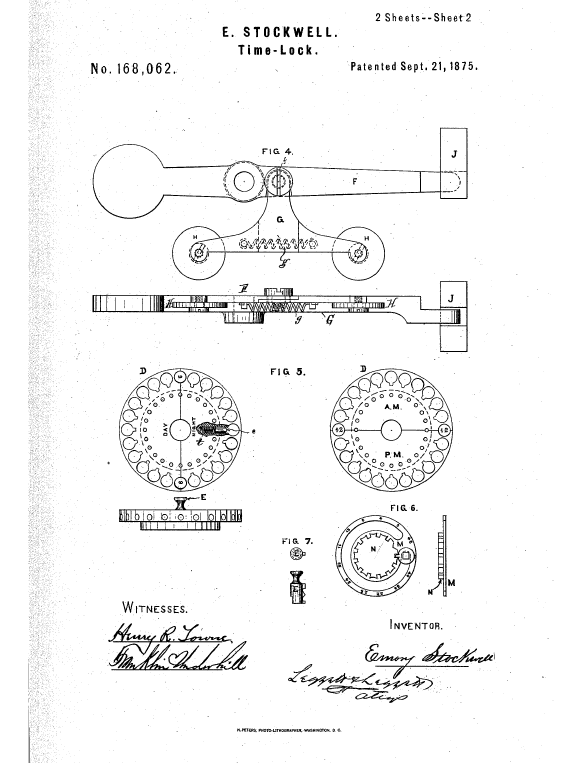 Refer to second sheet of patent illustration above. The Yale time lock contains two chronometer movements which revolved two dial plates studded with 24 pins to represent the 24 hours of the day. These pins, when pushed in, form a track on which run rollers supporting the lever which secures the bolt or locking agency, but when they are drawn out the track is broken, the rollers fall down and the bolt is released. 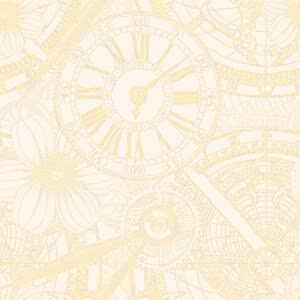 By pulling out the day pins, save from 9 until 4 the door is automatically prepared for opening between these hours, and at 4 it again of itself locks up. For keeping the safe closed over weekends and holidays, a subsidiary segment of track is brought into play by which a period 24 or more hours is added to the locked interval. Careful provision is made against the eventuality of running down or accidental stoppage of the clock motion, by which the rightful owner might be as seriously locked out as the burglar. Compare this model to the Yale single pin dial (a rarer version). An original Yale advertisement c. 1876. Notice that the time lock is upside-down! This document shows the interesting (confusing) numbering system Yale used for their Double Pin Dial models. Next is a Diebold safe equipped with a Yale double pin dial. The medallions are on Yale’s Double dial bank lock with the two sides of the Paris exposition medal of 1876 where it won silver. The portrait is of Napoleon III. This is an example of cross branding in the time lock industry. Diebold had not yet at this time entered into the time lock business so the Yale was added as an 'after market' product. 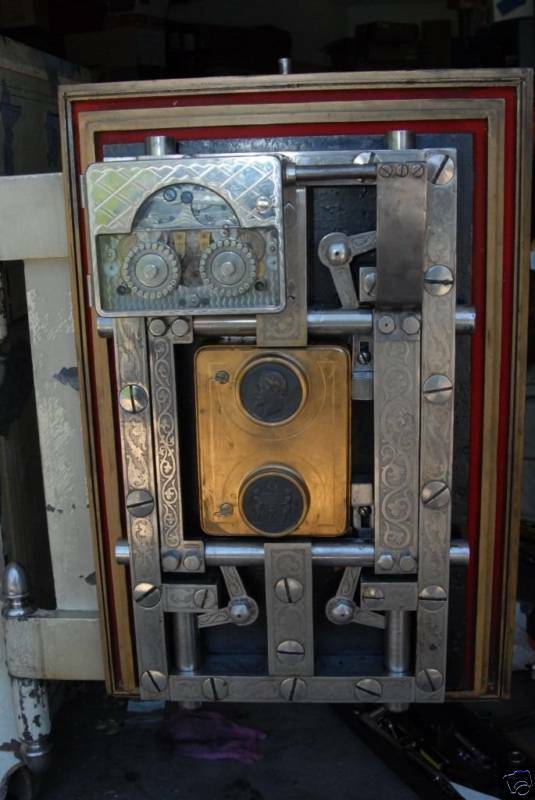 What's even more interesting as that this safe used Yale equipment for the combination locks so this was an installation made before Diebold entered the time lock business in 1916. (1) The pin dial is clearly a far more complicated design than Sargent & Greenleaf's Model 2, offered a number of innovations, the most obvious being the two front dials, each with series of twenty-four pins. Every pin, embossed with an hour of the day, could be pushed in, locking it, making the Pin Dial the first time lock capable of both unlocking and locking a safe at a predetermined time. Further the Pin Dial was the only mechanical time lock ever to be able to lock, unlock, and re-lock a safe for various one-hour periods throughout the day. 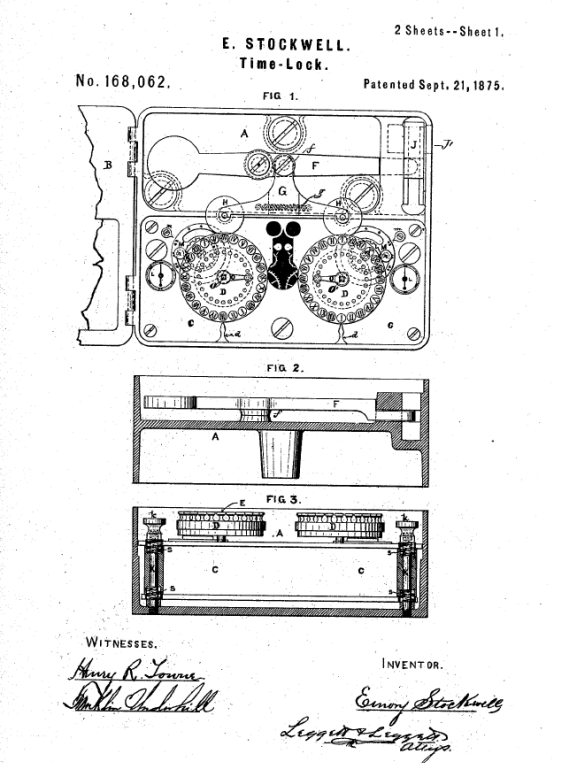 American Genius Nineteenth Century Bank Locks and Time Locks, David Erroll & John Erroll, pp 164. 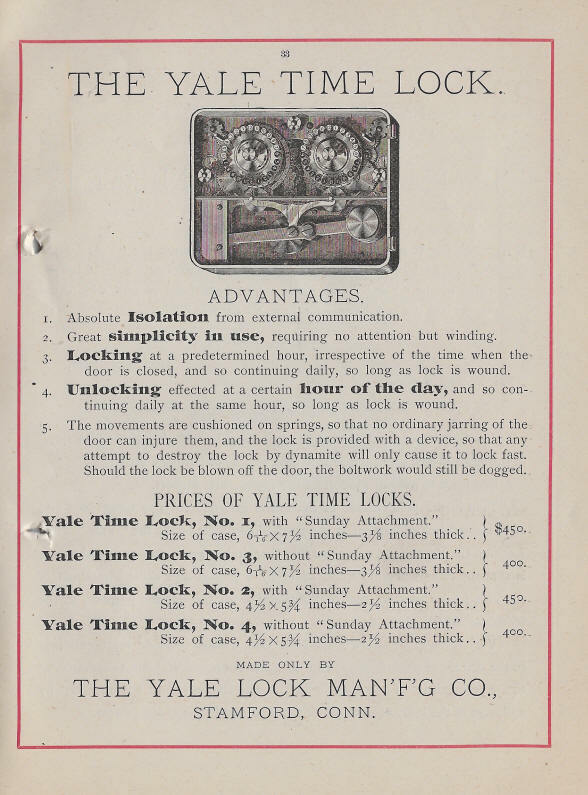 (2) In 1876 Yale added the Sunday Attachment, which allowed the lock to skip the opening periods each Sunday. 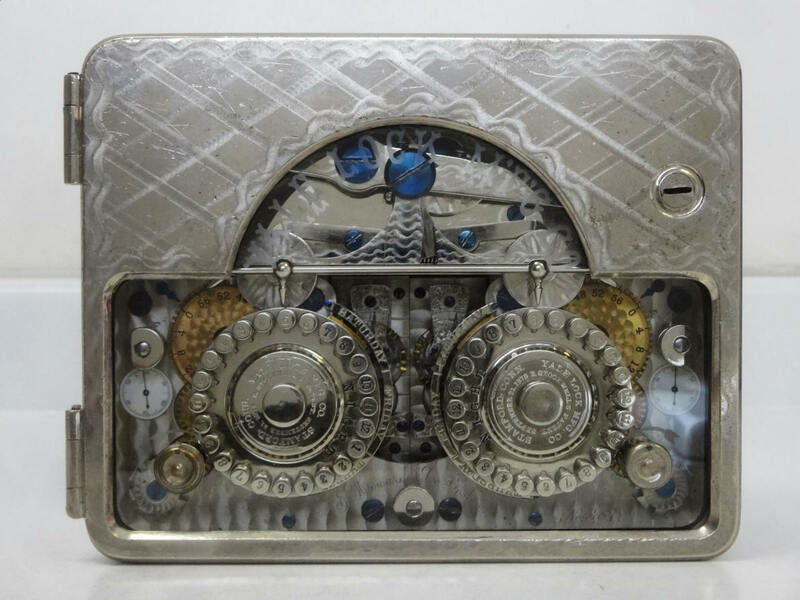 The mechanism is identified by two curved nickel runners next to the inner top third of the pin dials embossed with "Thursday Friday Saturday" and a small shield on each dial that is geared to rotate at one-seventh the rate of the dial. 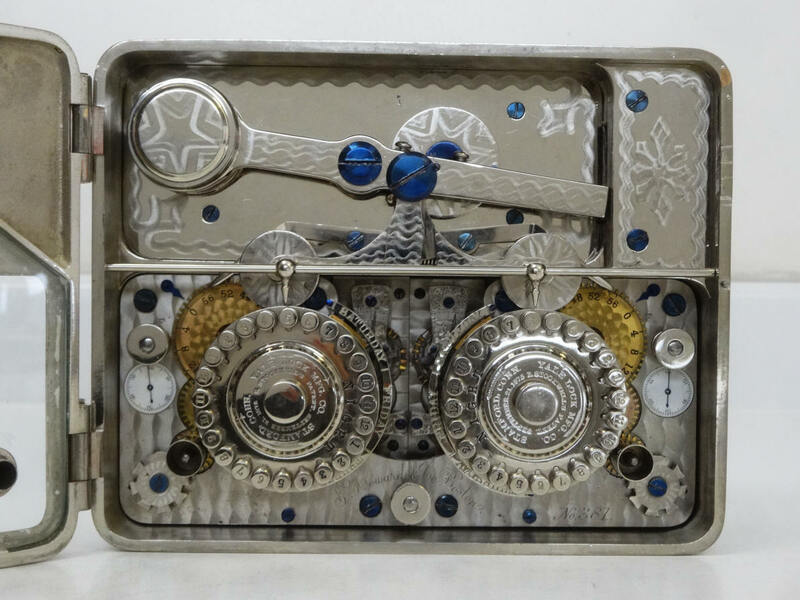 These shields move over the the names of the days, allowing the user to check to make sure it is accurate, and then, during the twelve hours Sunday day, will be interposed between the drop wheel and the pins, guarding the opening of the pulled pins and keeping the lock shut. This option was available after 1885. American Genius Nineteenth Century Bank Locks and Time Locks, David Erroll & John Erroll, pp 164.